FOR AN AFFORDABLE PRICE, WE CAN MAKE YOUR ENVIRONMENTAL TECHNOLOGY AND SUSTAINABLE SOLUTION KNOWN IN BRAZIL! We are an international company working exclusively to improve the trading of environmental technologies and services among Europe, Brazil and some countries of Latin America. We offer wide and flexible services in the fields of: translation and localization of marketing material, advertising in the properly language, market development and networking, international sales, business mediation and special event's organization. ▪ Around 30.000-35.000 industries and professionals in our database (it includes social media and emails). Visit our marketplace for Brazil and Latin America! 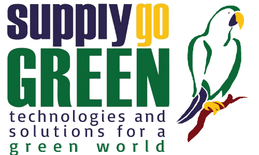 ® Ambiental Mercantil | O portal mais ambiental do Brasil is a trademark of SUPPLYgoGREEN technologies for a green world.